One of the unique features with the Kobo Aura One is its ability to search for and download library ebooks directly from the Kobo store for free. Other Kobo ebook readers and most ePub ereaders in general require using a computer to download library ebooks and Adobe Digital Editions to transfer them to the reader. It sounds easy enough but it’s about ten times more complicated and inconvenient than it needs to be. The whole process of finding and downloading library books is much easier on the Kobo Aura One, but it doesn’t come without certain limitations. The main problem is you can only be signed into one library at a time. If you borrow ebooks from multiple libraries you’re not going to be able to use more than one of them at a time unless you sign out from one and sign into another. However, there is an easy workaround that lets you get ebooks from more than one library onto the Aura One at the same time. 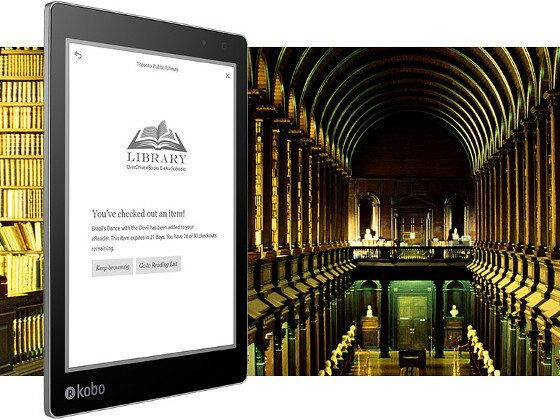 The only catch is you’ll still only be able to use one library to browse for library ebooks from the Kobo store. The trick is to sign in with an Overdrive account on the Aura One instead of your library account. It can sync with your Overdrive account to add library books that way in addition to downloading them from the Kobo store. You can setup and manage your library accounts at Overdrive.com. Once you have multiple libraries setup on your Overdrive account, you just have to sync to get your borrowed ebooks to appear on the Aura One. You’ll have to sign out of your existing account on the Aura One and then login with your Overdrive credentials, and they you’ll still only be able to choose one library to use on the Aura One, but you’ll be able to sync ebooks from multiple libraries. The Libby app helps make the process a lot easier. You can install it on a phone or tablet and set it up to use multiple libraries and sync with your Kobo. Is there any expectation for a new Aura One which I will call Aura Two on the horizon? I would like to get one of these, but would hate to see some new and better model come out right after. I know about the 32 gb version, but it is the same hardware. There haven’t been any signs of a new model from Kobo but you never know. I wouldn’t be surprised if the Aura One stays the same for another year or two. The technology evolves much slower than other electronics. It’s less than 1.5 years old at this point. Compare that to the Kindle Paperwhite that will be hitting the 3 year mark this summer, and the Voyage is already over 3 years old. Kobo tends to update a bit more often though. There was about a 2.5 year gap between the two H2O models. I wonder how common this is, since libraries usually have residency requirements for cardholders. Maybe this would be helpful for students away from home, or for frequent travelers? In the Overdrive account you can add and search multiple libraries without actually having the cards needed to borrow titles from all of them. If you see titles that your home library does not own, this might encourage you to ask your home library to purchase those titles from Overdrive. Or you might use the “Available to buy” links to Amazon or iTunes. So while the “multiple libraries” option may benefit what I’m guessing is a few users who can take advantage of it, it seems like more of a way for Overdrive and its partners to sell more eBooks. Not that this is bad, but just something to be aware of. Could you do this with two accounts for the SAME library? My husband doesn’t use his account much, so I use it in addition to my own account. In Indiana, for an annual fee paid to the Indiana State Library, one one can get a one-year card at any public (county or city) library in the state. Not every participating library allows circulation of digital material for nonresidents of the city or county under this plan. However some to, including the big library in Indianapolis. The last para is pretty confusing. Why should I install Libby on my phone or tablet to sync with Kobo? Does this replace going online to overdrive to sign in to multiple libraries? Can’t libby be installed on Kobo? Aren’t they both produced by Rakuten? You can’t install apps on a Kobo, and some prefer the Libby app because it’s more streamlined than Overdrive. I’m one of those apparently “few users” for whom this is very relevant. I have membership cards at two local libraries, and would love to be able to access both via Overdrive on my Clara HD. How do I synch to my Kobo from Libby? Thanks Nathan, I will give that a try.